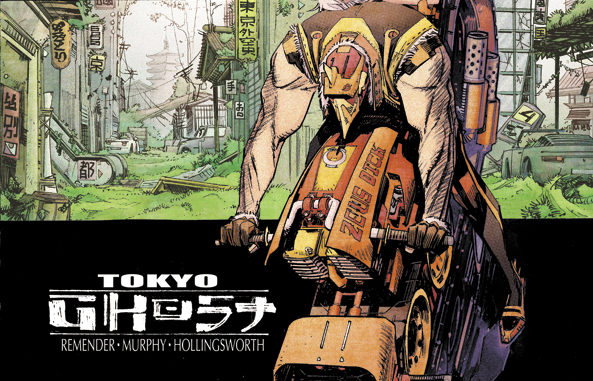 Image’s Tokyo Ghost is scary, but not in the horror-flick/ghost story kind of way. No, Tokyo Ghost is frightening because its pointed commentary reveals a harsh truth about our current social norms, and how we might be evolving as people. The team of Rick Remender (Uncanny Avengers), Sean Murphy (Punk Rock Jesus), and Matt Hollingsworth (Daredevil), bring to life a dystopian landscape in 2089 Los Angeles. Here, people have fused their lives with technology, the internet, and constant information. People who embrace this lifestyle are basically junkies losing themselves to the drug that is virtual reality. Along with being addicts in the real world, people often lose their identities, become a shell of a person almost, and depend on a codependent loved one to help them get by. 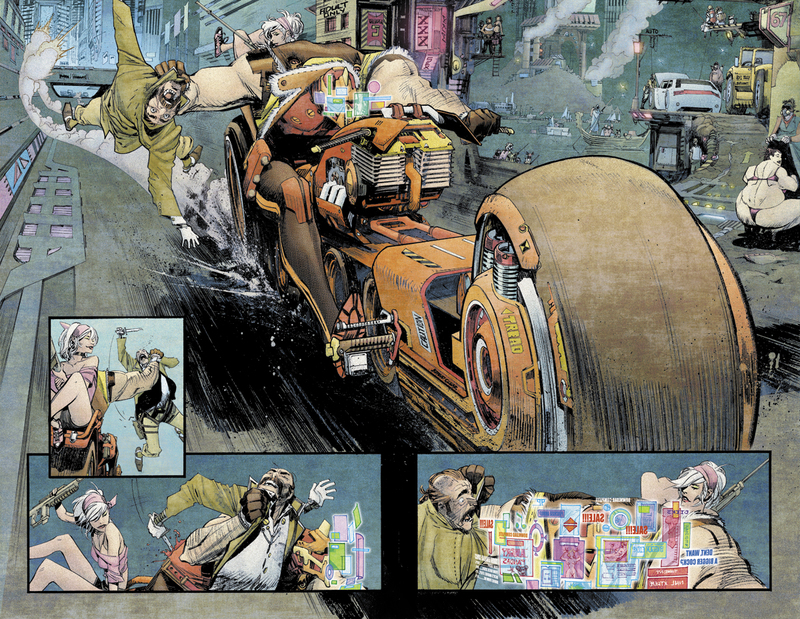 That’s how the more technologically plugged-in characters seem to work in Tokyo Ghost, while the characters clean from this addiction are labeled straight-edge. While reading it, I saw signs from my personal life that helped me believe the world of Tokyo Ghost was alive. I’m very aware that when I have dinner with my partner, I tend to look at my phone to see view counts, read my emails, and scroll my newsfeed. When I stop and look around at every one else in the restaurant, I’m guaranteed to see more than one person checking their phone as well. If we sit and think about it, we need information NOW. We always do. I’m guilty of deactivating my social media accounts and feeling withdrawals the very next day. This isn’t new to me because I’ve heard several people say the same thing. We’ve blended ourselves with tech. We’re basically cyborgs and drug addicts, but this fusion is still in its infancy. Imagine if decades pass, technology matures, information is received at unimaginable speeds, and we’re able to modify ourselves with the click of a button. What would that world look like? How would our morals evolve? What if we lose our closest loved ones to being plugged-in too deep for too long? All of these questions have answers in Tokyo Ghost. While left with a thousand questions after reading issue #1, I’m happy that I wanted more. There’s a lot of critique here, unbelievable art that makes the world breathe, likable and relatable main characters, and a very controversial villain. Simply put, I loved reading this book. It’s not perfect, however. While the serious themes and pointed social commentary blend perfectly together, there seems to be an imbalance with the graphic and bloody action. Sure, I can see how it fits, but it’s disappointing knowing that a younger reader can’t pick up this book due to its content, which perhaps could help them question the amount of technology that they use in their everyday. I’m also aware that some adult readers may be turned off by the book’s hyper violence. Those violent panels disturbed me momentarily, and almost distracted me from the awesome message and stunning art. However, there’s too much good here. The book is highly original, mature with themes, thought-provoking, and filled with a ton of eye candy. It’s one of those pieces of entertainment that can generate a lot of interesting conversations within social groups. I want all of you to read a copy so that I have people to talk about it with. Next The Future is Now!